Annotated and illustrated map on "Sherlock Holmes in Meiringen"
"It is with a heavy heart that I take up my pen to write these the last words in which I shall ever record the singular gifts by which my friend Mr. Sherlock Holmes was distinguished." This is how Dr John H. Watson begins „The Final Problem“, first published in the December 1893 issue of the Strand Magazine. „The Final Problem“ takes Sherlock Holmes and Dr. Watson in spring 1891 to Switzerland. They are in escape of Holmes's arch-enemy Professor James Moriarty. The inevitable follows. Dr Watson is summoned back to Meiringen to help a dying English lady. 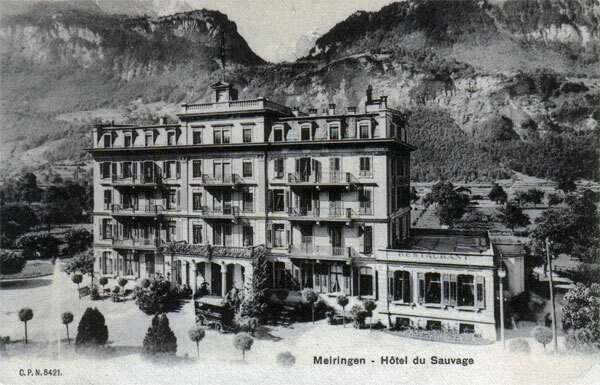 Back in Meiringen, Dr Watson realises that he has been trapped - there was no sick Englishwoman. niemand weiss von einer kranken Dame. 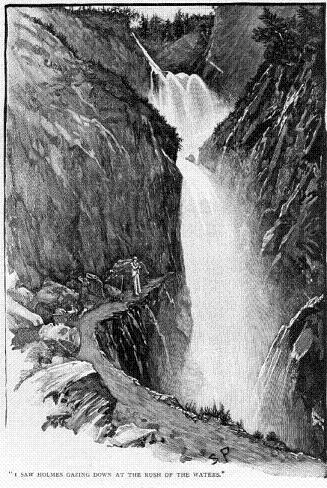 Dr Watson hastens back to the Reichenbach Falls, but there is no sign of Sherlock Holmes. „I stood for a minute or two to collect myself, for I was dazed with the horror of the thing. Then I began to think of Holmes's own methods and to try to practise them in reading this tragedy. It was, alas, only too easy to do. (...) Two lines of footmarks were clearly marked along the farther end of the path, both leading away from me. There were none returning. A few yards from the end the soil was all ploughed up into a patch of mud, and the brambles and ferns which fringed the chasm were torn and bedraggled. (...) I shouted; but only that same half-human cry of the fall was borne back to my ears. (...) An examination by experts leaves little doubt that a personal contest between the two men ended, as it could hardly fail to end in such a situation, in their reeling over, locked in each other's arms. Any attempt at recovering the bodies was absolutely hopeless, and there, deep down in that dreadful cauldron of swirling water and seething foam, will lie for all time the most dangerous criminal and the foremost champion of the law of their generation." Scene from "The Final Problem" (Granada TV 1985) with Jeremy Brett (Sherlock Holmes), David Burke (Dr. Watson) and Eric Porter (Prof. Moriarty), shot on location at the Reichenbach Falls and at the Giessbach Falls in the Bernese Oberland, Switzerland. Fearing another blow by Moriarty's gang, Holmes decided to go into hiding. As a Norwegian explorer named Sigerson he was traveled for two years in Tibet, passed through Persia, looked in at Mecca, and paid a short but interesting visit to the Khalifa at Khartoum, and spent some months in a research into the coal-tar derivatives in a laboratory at Montpellier, in the south of France. In the world of Sherlockians, this period is referred to as the "Great Hiatus". The Adair murder case was the perfect opportunity for Holmes to return to London in spring 1894 in order to get hold of Moriarty's gang. Years later, Sherlock Holmes and Dr Watson return to Switzerland. In „The Disappearance of Lady Frances Carfax“, first published in 1911, Holmes and Watson are investigating in Lausanne at the Lake of Geneva – a letter sent from the Hôtel National in Lausanne was the last sign from that Lady and the startig point for the solution of her mysterious disappearance. In September 1988, the Sherlock Holmes Society of London unveiled a life size statue of Sherlock Holmes in Meiringen, sculpted by English artist John Doubleday. On the statue and the accompanying plaques sixty clues are hidden - one for each of the sixty original Sherlock Holmes stories written by Arthur Conan Doyle. Some of them are obvious - some are not. Happy searching and finding, deducing and combining! 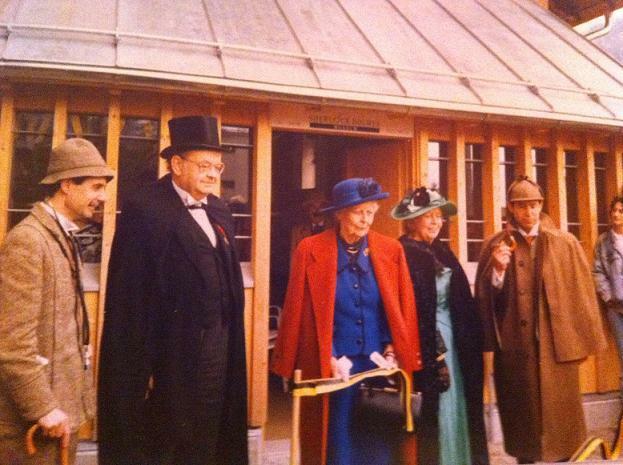 On May 5, 1991 Dame Jean Conan Doyle, youngest daughter of Sir Arthur Conan Doyle, opened the Sherlock Holmes Museum in Meiringen. The Museum is located in the crypt of the old English church opposite the Parkhotel du Sauvage (the "Englischer Hof" from "The Final Problem"). It hosts an authentic and sophisticated reconstruction of the sitting room of 221b Baker Street. The place in front of the museum was re-named into "Conan Doyle Place" on the same occasion. 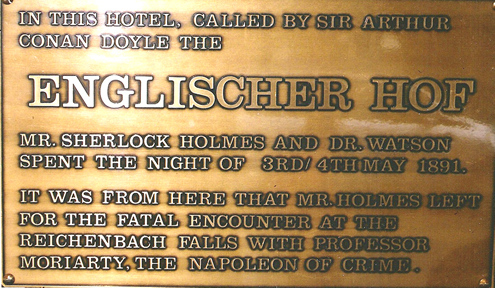 Various commemorative plaques refer to the fateful encounter between Sherlock Holmes and Dr Watson in Meiringen and at the Reichenbach Falls (see annotated and illustrated Google map). The first of these commemorative plaques was unveiled in November 1952 by W.T. Rabe of The Old Soldiers of Baker Street in the Hotel Rössli, Meiringen - an inn then identified by the group as the original "Englischer Hof". The plaque currently on display in the Hotel Rössli is likely to be a later reproduction. Tony Howlett, prominent member of the Sherlock Holmes Socitey of London, some time before located the exact spot where the death struggle must have happened. It is since marked with a white star which can be seen from the top station of the Reichenbach funicular. At the same spot, the The Bimetallic Question of Montreal and the Reichenbach Irregulars errected a commemorative plaque in 1992.